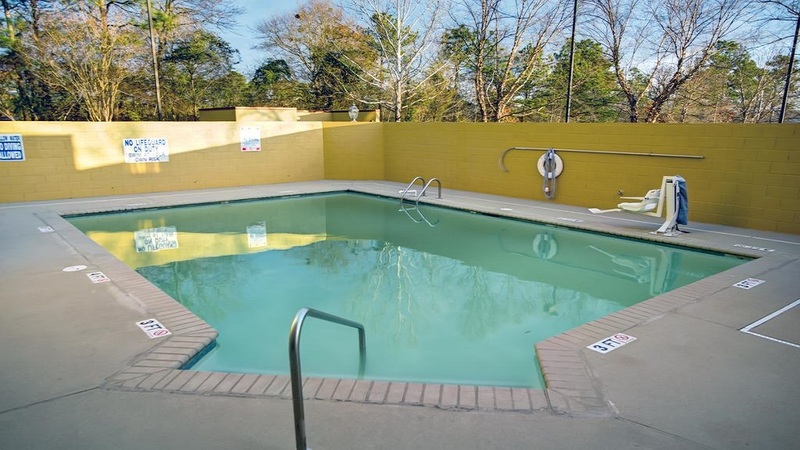 Comfort Inn is a reliable, affordable hotel in Blythewood, SC that is focused on providing its valued guests with remarkable hospitality. Our hotel is in a great location with easy access to Carolina Adventure World and within walking distance to popular restaurants like Carolina Wings & Ribhouse and San Jose Mexican. Comfort Inn Blythewood takes pride in what we do. Delighting customers is about more than just meeting their needs in the moment. We want our valued guests' to have a memorable experience from start to finish. Amenities included in your stay are WiFi, free hot breakfast, free parking, seasonal outdoor pool, and a fitness center to get your exercise fix in. Are you trying to make the most of the vacation time you have? We have your solution. When you book a room at our Comfort Inn hotel, you will be immersed with friendly hospitality and accommodating amenities. These in-room amenities include microwave and refrigerator, coffee maker, flat-panel TV and hot tub in select rooms. Plus, pack the leash and the treats because our Blythewood hotel is pet friendly. Marvelous meals are often what you remember most when returning from a trip, so why not make food the main focus of your next vacation? Scottie's Cafe & Grill, San Jose Mexican Restaurant, Cobblestone Park Restaurant and Bar, Lizard's Thicket Restaurant, Carolina Wings & Ribhouse, and Olde Town Hall Restaurant & Pub will satisfy all appetites. If you are looking for nature to explore, Doko Meadows is one of Blythewood's most beautiful attractions. If you're looking for a calm, relaxing stroll, you’ll find it here. If you’re a fan of fishing, bring your rod and reel and cast into the lake. You’ll find it stocked with bass and bluegill. Riverfront Park is Columbia's most popular jogging and biking trail that takes you for two and half miles along the lush banks of the Broad River. You can also enjoy the Botanical gardens in Blythewood, TN which consists of lush woodlands, theme gardens, historic ruins, rare plant collections. The outdoors is calling your name. Known for its festivals, Blythewood is full of events all year round. Check out the Township Auditorium and the Colonial Life Arena for the latest concerts and shows, including Jerry Seinfeld, the Red Hot Chili Peppers, and local artists. The Nutty Squirrel, Lite Um Up Cigars, Trackside Tavern, CarraRock Entertainment, and Beef 'O' Brady's should be your go-to places for a night on the town. EdVenture is the largest children's museum in the Southeast United States, located in Columbia, South Carolina.EdVenture opened to the public in 2003.It has 8 galleries covering 92,000 square feet, plus hands-on exhibits, 2 resource centers, and a 200-seat theater. 40,000 square feet of the total 92,000 square feet is devoted to exhibit galleries, laboratories and visitor amenities. An additional 7,000 square feet of outdoor gallery space is located just outside the museum's front door. Within the total 92,000 square feet there are approximately 350 individual hands-on exhibits. There is also a statue of 'Eddie' on the first floor of the museum which children can climb into and learn about the insides of people. The Riverbanks Zoo and Garden is a 170-acre (69 ha) zoo, aquarium, and botanical garden located along the Saluda River in Columbia, South Carolina, United States. A small portion of the zoo extends into the nearby city of West Columbia. It is operated by the Rich-Lex Riverbanks Park Special Purpose District, a partnership of the city of Columbia and Richland and Lexin gton counties. It is overseen by the Riverbanks Park Commission, comprising two members each from the three governments and one at-large member. The University of South Carolina (also referred to as USC, SC, South Carolina, or simply Carolina) is a public, co-educational research university in Columbia, South Carolina, United States, with seven satellite campuses. Its campus covers over 359 acres in downtown Columbia not far from the South Carolina State House. The University is categorized by the Carnegie Foundation for the Advancement of Teaching as having "highest research activity. "It has been ranked as an "up-and-coming" university by U.S. News & World Report,and its undergraduate and graduate International Business programs have ranked among the top three programs in the nation for over a decade.It also houses the largest collection of Robert Burns and Scottish literature materials outside Scotland,and the world's largest Ernest Hemingway collection. Village at Sandhill is a 300-acre lifestyle center located in the northeast area of Columbia, South Carolina. It is located halfway between Interstate 20 and Interstate 77 on Clemson Road at the intersection of Two Notch Road. It competes with Columbiana Centre and nearby Columbia Place.Village at Sandhill was developed and is owned by Kahn Development Company. It originally opened in late 2004 and is still currently under construction. When it opened, its first tenants were *PLEX Indoor Sports, Rhodes Furniture, World Market and Super Bi-Lo.The open-air center offers a mix of nationally and locally owned merchants and restaurants, as well as numerous national and region banks like Wells Fargo, Regions Bank, First Citizens Bank and BB&T. The national anchors include JC Penney, which opened in 2005, The Home Depot, which opened in 2006 and Belk, which opened in 2007. Stayed one night while traveling back to Michigan. Very nice accommodations and very friendly staff. Room was very clean, breakfast was good with a very nice variety of items to choose from. The personnel at the front desk were more than helpful with recommendations for restaurants for dinner. We travel with a small dog and the hotel is great for him. Will definitely stay at this hotel the next time we are in the area. Good choice for the night. Desk staff - friendly and welcoming, room nicely appointed and clean, comfortable bed linens. Breakfast buffet was more than adequate with hot and cold choices and well maintained. We were pleased to find that they had 2 rooms as there were 4 of us the rooms were very nice and clean. The breakfast was very good the lady in charge of the breakfast was very helpful.All in all it was it was a good place to stay. Our family of four stayed one night at this hotel on our way from PA to FL. It was comfortable and clean.The pool was clean and in an enclosed area, which was nice. Our room was appropriately stocked with towels and shampoo conditioner and soap. The refrigerator was large enough to hold a good number of water bottles and refrigerated items we were taking with us on our trip. The breakfast was very good. Very nice Comfort Inn. The staff is very helpful and pleasant. The rooms are updated and very clean. The rooms have a microwave and refrigerator. Very large breakfast area with a full hot breakfast. Very small and tight parking lot. Located just off the interstate for convenience. Plenty of restaurants in the area. We stayed over the Mother's Day weekend for two days and we had two rooms. Rooms were spacious and clean with updated bedding package. Beds were comfortable and the rooms were also quiet. There were a variety of restaurants in easy walking distance of the hotel. Greeted and checked in great. Room very clean and comfortable. Pool great. The breakfast hosted was amazing. She did a great job of keeping up with demand and was friendly the whole time. Definitely stay here again. As a resort manager I very rarely give thumbs up across the board but this hotel gets it. The check-in was nice and easy the lady who checked me in was very friendly. The room itself was nice and big and clean it.The bed was fine. The breakfast was pretty good. the host was very friendly. Over all it was a good stay close to alot of fast food places, well lite parking lot close to 77. Would I stay here again? 100% yes! I stayed 2 nights here on my way up to West Virginia and also on my way back home to Florida. The hotel is clean, comfortable and staff are helpful and friendly. The price was reasonable.